The Copa Crew girls’ basketball team is registering participants and sponsors for its second annual Back to School Tournament. Girls teams at the JV and 13U levels are invited to compete in the event, which will take place Aug. 28-29 at Maricopa Wells Middle School. Copa Crew co-founder and coach Dee Estrada is hoping to sign up 16 teams for this year’s tournament; the inaugural event in 2009 involved 12 teams. Estrada said six teams have registered thus far, including the defending tournament champion Salt River Renegades. The Copa Crew JV team also will be aiming to earn another trophy after placing third last year. The entry fee is $225 for teams that sign up by Aug. 23 and $250 for teams that register from Aug. 24-27. Multiple-team discounts are available. Each team will be guaranteed three games in the tournament, which will run from 8 a.m. to 8 p.m. Aug. 28 and from 3 to 8 p.m. Aug. 29. Trophies will be awarded for first, second and third places. AAU rules will apply. Teams interested in participating in the tournament can call Dee Estrada or her husband, Jesse Estrada, at 909-553-5999 or 951-313-5265. The coaches also can be contacted by e-mail at copacrew10@aol.com. Sponsors can set up booths at the event at a cost of $20, which covers both days. The sponsor registration form is available on the Copa Crew team’s Web site at www.copacrew10.webs.com. The deadline to register for booths is Aug. 23. Estrada is encouraging fans to come to the Maricopa Wells gym and watch the Back to School Tournament games. Tickets will be available at the door at a cost of $5 per day for adults and $3 for students with an ID. Children ages 5 and younger will be admitted free. Jesse and Dee Estrada founded Copa Crew in 2008. Their daughter Brianna Estrada, who is a sophomore at Maricopa High School, is one of the original team members. The Copa Crew players range from 8 to 16 years old. The team captains are Brianna Estrada and Paige Provost, both of whom also play varsity basketball for Maricopa High School. The Copa Crew teams participate in tournaments throughout the year. 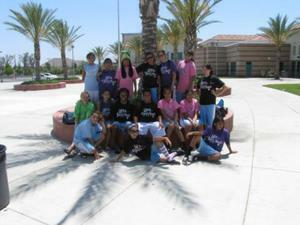 Last month, they competed in an event in Corona, Calif.